I was part of the music team for Cloud Atlas, working as an arranger and music programmer. The soundtrack is available on iTunes and Amazon. I co-composed the music for the feature I Do, which is premiering at festivals worldwide. I composed the punk music score for the short Genderfreak, and the soundtrack is available on iTunes and CDBaby. I composed additional music for the movie Killer Elite. You can purchase the soundtrack on Amazon. A track of mine was recently featured in a Target commercial, and also featured in Animal Planet's "My Cat from Hell." I scored the music for the Italian film 6 Days on Earth along with industry veterans Johnny Klimek and Reinhold Heil. I produce electronic music under the name Jordan B. New tracks below. I orchestrated music for the band Dirty Vegas and the New World Symphony at their Synesthesia event in Miami. More news can be found in my blog. I am a Los Angeles-based classical and electronic composer available for film scoring, TV, video game soundtrack, and commercial work. A Composer's C.V. is available upon request. Please listen to my work samples and feel free to contact me via or at (310) 800-2754. All music copyright 2016 Jordan Balagot. Here is the most recent work I've done. Licensing often does not permit me to display the work online, but a few clips are available in the Video section below. To install, right click and save the links below, then drag the m4r file to iTunes. Connect your iPhone, and under iPhone>Ringtones check sync all ringtones and sync the phone. This Target commercial features my music, currently airing nationally. I wrote additional music for Killer Elite, including the tracks "Radio", "Feathermen", and "Hunter's Release". I was commissoned by Onrie Kompan to score this trailer for the Yi Soon Shin Comic. I produce electronic music as Jordan B LA. I co-produced a track with the band Suspicious Package and have an upcoming music video coming out with them. Many of my tracks were commisioned for commercials for the company Bangstyle. Please follow me on SoundCloud as Jordan B LA. This is the trailer for the 44th Annual Chicago International Film Festival. I did the music and Ken Nordine did the film design and voiceover. The trailer plays before each movie at the festival. 2008. The very talented Isaac Speding of New Zeland used the Ravel String Remix for his Motion Graphics Reel. Click for other videos by Isaac Speding on Vimeo. 2008. A semi-robotic cop chases the phantom tagger, torn between killing or falling in love. A dance piece with live music and electronica. For Columbia Chicago's Music for the Screen MFA program. 2008. Two singles serenade each other with fantasy dances in a surreal club. For Columbia Chicago's Music for the Screen MFA program. 2008. An original film with original music. It's 2012. President Palin has been unable to stop the collapse of the global economy. The catastrophic Ginger virus has the ability to spread between humans and computers alike. It has taken over the world bank databases and it produces devastating isolation among its human hosts. Story by Andy Hill. 2008. This is a rescoring of a clip from a popular film, and rendered in ASCII to prevent copyright violation. The audio has been completely replaced. Scored and rendered with Finale and GPO. 2006. This is a score to a scene from the play Translations. 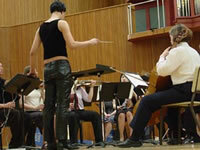 The score was composed to video and then both were performed live together. The characters in the play, George and Maire, don't understand each other but find other ways to communicate. From a recital for Columbia Chicago's Music for the Screen MFA program. 2008. An orchestration of a theme by Bartok, with information overlaid (a scrolling score and a video of the film scoring recording session). Click on the high quality version on youtube and make it full screen to see the score. Music played by members of the Chicago Civic Orchestra conducted by Cliff Colnot. 2008. This is a short clip of a submission I sent to the Turner Classic Film Scoring Competition. The music was done in Reason. Real player version still available. 2003. Raquetball is a short drum 'n bass music video, created with live video, Canoma 3D renderings, and Propellerhead Reason. Real player version still available. 2003. This was written in memory of Leslie Roberts, a friend and fellow composition major who died suddenly in the spring of 2002. This piece was not written about her, but was rather an expression of my shock and anguish of her death. This recording was performed by a student orchestra and conducted by Jeff Nelson at my senior composition recital at Oberlin, April 20, 2003. The Concerto for Drum 'n Bass was written in an attempt to bridge the gap between classical orchestral music and intelligent dance music. It is written for live orchestra and CD, and was performed by a student orchestra at my senior recital. I wrote the electronic parts in Propellerhead Reason, and conducted the orchestra while cueing the CD. 2003. Written for Jess Rossi for her Oberlin senior voice recital, for string quartet and voice. Cowritten with Leighanne Saltsman, who also wrote the lyrics. Performed at Jess Rossi's senior recital. 2000. A Jazz Ballad for piano and voice, sung by Leighanne Saltsman. 1999. Recording of a rehearsal. Written in memory of Mabel Dennison, who passed away in the fall of 2001. For SSAATTBBB choir and as sung by the Offbeats. This a cappella piece attempts to imitate several electronic effects. 2002. Studio Recording. Commissioned by Francis W. Parker school for their alumni centennial celebration, performed by the Northwestern Brass Ensemble. Recording of a rehearsal. 2000. A short 6/8 drum 'n bass remix of the classic Ravel String Quartet no. 1 in F major. Made with Reason, 2002. A short clip of a house song. Made with Reason, 2002. A fusion of classical music and drill 'n bass / breakcore, 2008. A Man's Image (short), 2008. Carolyn Okafor, Director. Peeling it Off, 2008. Matthew Singletary, Director. Confession, 2008. Timothy Vannette, Director. The Usher, 2008. Carolyn Okafor, Director. Among All Creatures, 2009. Tyrone Acierto, Director. A Man's Image (feature), 2009. Carolyn Okafor, Director. The Chicago International Film Festival 2008 Trailer. Ken Nordine, Producer. Spark Productions Motion Reel. Isaac Speding, Animator. I have started tracking mp3 downloads off this site. Most of my traffic comes from music search engines Soso, Sogou, Baidu, Tagoo, Beemp3, etc. which have only indexed my old mp3s. Please check out my more recent music (see Recent Work)! Statistics tracked with custom code and HTML-Graphs.